I needed to make a memorial stone for my kitty, who passed away last month. If you’ve seen any of my other videos, you met my kitty. She always came running as soon as she heard me talking to the camera. When he heard that I was making a memorial stone, our friend Rex Winn sent me those beautiful stained glass letters. That was awfully sweet of him. Thank you, Rex! I’m hoping we can talk Rex in to posting some photos of his own stained glass mosaics in the comment section down below so you can see how the letters might have looked if I actually knew what I was doing. Even though I didn’t follow his excellent instructions (I did warn him that I’m not good at following directions!) I still really like the way the stone came out. The only thing I would do differently is to leave a solid color behind the letters, because that would make them stand out better. I’m especially happy with the way the drawing of the kitty looked after being scratched into the wet Quickwall, and the addition of the catmint sprig. My kitty really liked to sleep under the catmint. By the way, the Quikwall is not available in all states. I don’t know why not, but that’s just how it is. If you want to try it but you can’t find it at your local big-box store, they might be willing to order some for you. I bought mine for about $15.00 for a 50 pound bag, and I only needed a small amount for this project. 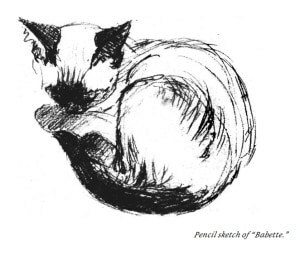 The model for my drawing was a pencil sketch I found in the book Drawing a Cat by Clare Turlay Newberry. Ms. Newberry doesn’t show us how to draw a cat, but her drawings are beautiful, and I used this one as an inspiration for my own drawing. It looks very much like my kitty did when she was very young. Her mother was a mitted seal-point Ragdoll cat, and her father was a Siamese. I simplified the drawing a great deal because I would be working with wet cement instead of drawing on paper. After the stone has been sealed, I’ll put it under the Black Ice plum tree I bought for my kitty. Planting a new tree is a tradition I started quite a few years back to help me honor pets who are no longer with me. I think the stone will be especially nice with the moonlight reflecting off the glass. I apologize for being so long in responding. I’ve been helping my sisters can fruit and jams for over a week and have not been near my computer. Attached is a photo that I made for Tikki, my dog’s sister, whom I was very close to. She died two years ago, and I went through a terrible period. I wanted to do something special for her, so I made a tombstone for her. This is the headstone; the “flat” part of the tombstone had a poem on it. I cut out the letters from glass and attached them to a cement backboard using silicone and then put grout between the letters. 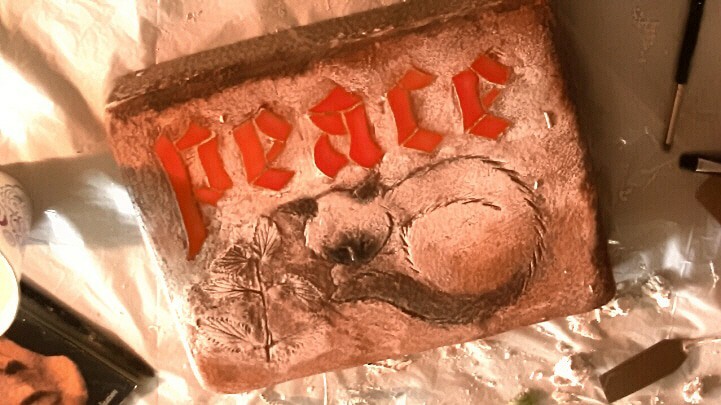 If I had been quicker in the mind, when I cut out the “peace” for Jonni’s cat – who was certainly the star in her videos – I would have made the pattern include background colors. Next photo will shot a “real” stepping stone, and you can see a solid glass surface would have been easier to put together. 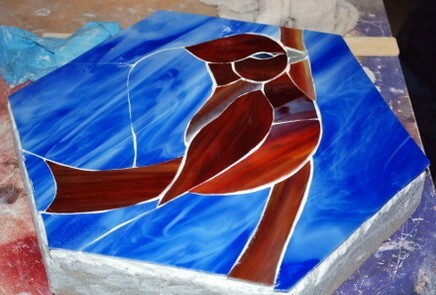 Here is a photo of a bird stepping stone I made for a neighbor. 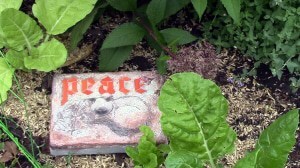 Blue would have been the perfect background color for “peace” for Jonni’s cat. I took a photo of Tikki and created a stained glass of her face. She was a red min pin. I love Jonni’s drawing of her cat, and it captures her well. 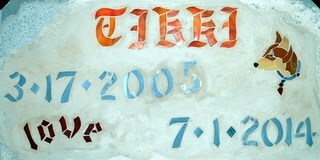 I love the portrait of Tikki in glass. What a nice reminder of a beloved pet. So very sorry for your loss of your beloved kitty!